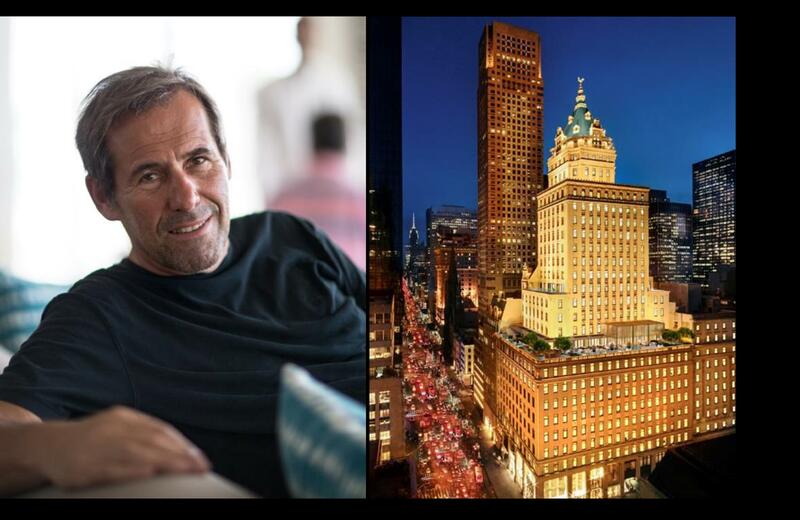 Jean-Michel Gathy, the legend behind some of the world’s most iconic luxury hotel and resort designs, has been commissioned to design the country’s first urban Aman Resort, Aman New York, in the city’s landmark Crown Building. Jean-Michel Gathy will bridge the harmonious ethos of Aman in the heart of one of the most bustling metropolises in the world. As Principal Designer of DENNISTON, Jean-Michel Gathy has specialized in ultra-luxury hospitality design, interiors and landscape for over 30 years, where he has worked alongside the industry’s top hoteliers and owners. He is the visionary behind some of the most esteemed Aman resorts including Amanyara in Turks and Caicos; Amanwana on the island of Moyo in Indonesia; Aman Sveti Stefan, an island which once acted as a fortified village in Montenegro; and Aman Venice, where his striking designs all feature a unique signature – they focus on the theme of romance and on incorporating water features, as well as local cultural elements and traditions, into the property. Located at the prestigious address of Fifth Avenue and 57th Street, overlooking Central Park, Aman New York will occupy the Crown building, one of the city’s most architecturally significant buildings. Built in 1921, 730 Fifth Avenue will undergo a vast transformation into Manhattan’s newest destination for unmatched luxury, comprised of 83 elegant guest rooms and suites, three social dining venues, a world-class spa, and an exclusive collection of 20 private homes representing the first urban Aman Residences. Residents of this very select community will have the unique opportunity to contract Jean-Michel Gathy to custom design their furnishings and interiors. 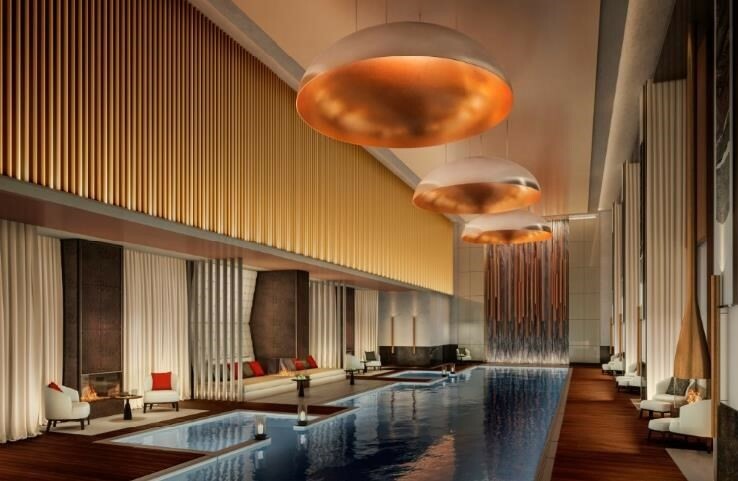 Upon arrival, guests’ first encounter of Aman New York will be its dramatic 10th-floor double-height Sky Lobby that features subtle Asian influences in tribute to Aman’s Asian roots. Aman New York’s 83 guest rooms start at 750 square feet, each have a functioning fireplace – a rarity for New York – and will be among the largest in the city. Jean-Michel Gathy will utilize nuanced hues and innovative lighting to create a soothing and undisturbed sanctuary, while incorporating a unique pivoting door for guests who prefer a more modern ambience, integrating contemporary fixtures and furnishings of the bathroom when opened. As dramatic water features are evident in all of Jean-Michel Gathy’s designs, the centrepiece of the elevated three-story, 22,000 square foot Aman spa will be a 25-meter indoor swimming pool – bordered by alcoves of double daybeds and fire pits – to exclusively provide hotel guests, residents and Aman Club Members a relaxing escape from fast paced city life. Two Spa Houses will offer guests a holistic spa journey with a spacious double treatment room, sauna and steam rooms complemented by hot and cold plunge pools, and an outdoor terrace with cabana, daybed and fireplace. Aman New York’s extensive array of lively public spaces and social venues will be the new high water mark among Manhattan’s elite social scene. Acting as its crowning showpiece is a 10th-floor wraparound Garden Terrace – an unequivocally rare feature given the urban location – which will feature a bar with sweeping views of Central Park, a Cigar Bar, and year-round dining. Jean-Michel Gathy incorporated soft water features and a central fire pit to create a strong visual narrative and abounding energy that further complements the Terrace’s unsurpassed outdoor environment. A stylish Piano Bar in the Sky Lobby, two restaurants, a Wine Library and a subterranean Jazz Club round-out the property’s signature elements. The property’s soaring pièce de résistance will be a five-story, 14,000 square foot park view penthouse – the Crown Penthouse – nestled into the iconic building’s ornamental gilded crown. Gathy’s signature designs have inspired many leading architectural works, which are showcased in a list of some of the most recognized hotels and resorts including the One&Only Reethi Rah, Maldives, St. Regis Lhasa, Tibet, Viceroy Snowmass, Aspen Colorado, Park Hyatt Sanya Sunny Bay, Sanya, The Chedi Andermatt, Switzerland, Aman Canal Grande, Venice, Amanwana, Moyo Island Indonesia and Aman Summer Palace in Beijing, Cheval Blanc Randheli in the Maldives, Amanyara Turks & Caicos, and The Setai in Miami, Florida. He founded DENNISTON in 1983, an architecture firm with a specific niche market, where he specializes in the creation of innovative designs for up-market hotels and other establishments in the industry. Thanks to its forward thinking architecture, design and technology applications in a constant state of evolution, DENNISTON has been able to retain its position as the market leader and a reference point for all designers in the industry. For more information on Jean-Michel Gathy, please visit www.denniston.com.my.